Happy Easter and good morning!!! This morning I’m up early to make baked eggs… I call them Maria’s Eggs, because the first time I ever had baked eggs was at my brother and sister-in-law’s house. They were yummy and ‘my favorite’, simple. I loved the concept of baking the egg, so I started to play with all the different ways I could serve this little gem. Recipes like this can be made in so many different ways once you have the basic premise. Perfect for a morning like today Easter Sunday. 2-4 ramekins (depending on how many you are cooking for). 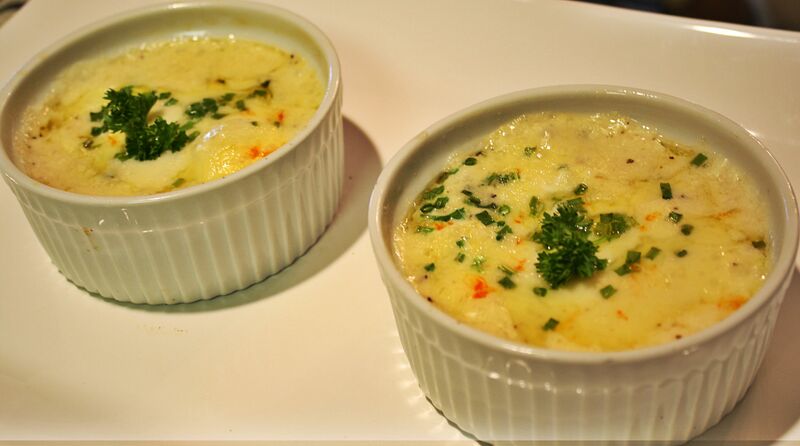 Butter the inside of the ramekins and crack an egg into each one, (try not to let any egg shells fall in. Nothing is worse than taking a bite of a shell in your cooked eggs). Melt butter, add flour and cook for one minute, stirring constantly with a whisk. Add milk and stir for 30 seconds more. The mixture will begin to bubble and thicken. Add salt and pepper. Whisk these ingredients into the Bechamel sauce, (some call it a white gravy). Pour into your ramekins on top of eggs in equal distribution, top with 2 Tbs of desired cheese, (I used a muenster cheese) and 1 Tbs chives. Bake at 350 degrees for 15 Minutes. Let cool for 5 minutes and there you go! Just a little footnote; These little gems can really be versatile. I’ve been known to add crab meat and aged cheddar to the Bechamel then topped it off with caramelized onions. On other occasions I added chopped dried apricots and almonds with a little sour cream in the Bechamel. Like I said, the sky is the limit with these little gems!!! Have fun with it!